Designed specifically for the poultry industry. 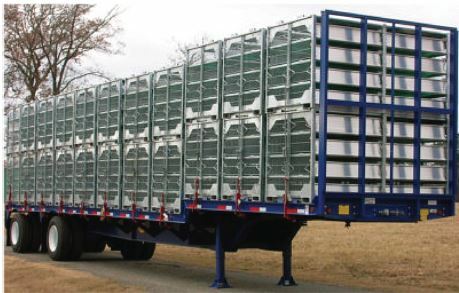 The Viking Specialized Poultry Platform Drop Deck is a poultry live transport trailer designed for chickens and turkey. Available front and rear bulkheads provide added security for cage movement and panels can be added to block direct wind during transportation. Capacity: 80,000 lb. GVWR. 24” Fabricated main beams with 2” camber, 1/2″” x 6” top and bottom flanges in the rear deck with 1/4” web welded on both sides. 1/2″ x 6″ top flange in the neck and 3/4″ x 6″ bottom flange in the neck. All flange and web material is high strength steel. 6” x 3.7# Jr. I beam on 16” centers. 2” SAE kingpin, 3/8” kingpin plate, 36” kingpin setting (standard). 8” x 8.5# structural channel; Inverted with nesting angles for chicken cages or smooth sides without nesting angles for turkey coops. Poultry platform trailers are shotblasted and primed with zinc-rich primer and top coated with a high solid polyurethane paint. Colors: black, red or cat yellow (standard). 7-Way main receptacle, sealed wiring harness, rubber mounted LED lights. 3 Lights per side including mid-turn (4 Light cornering system and back-up lights are available). 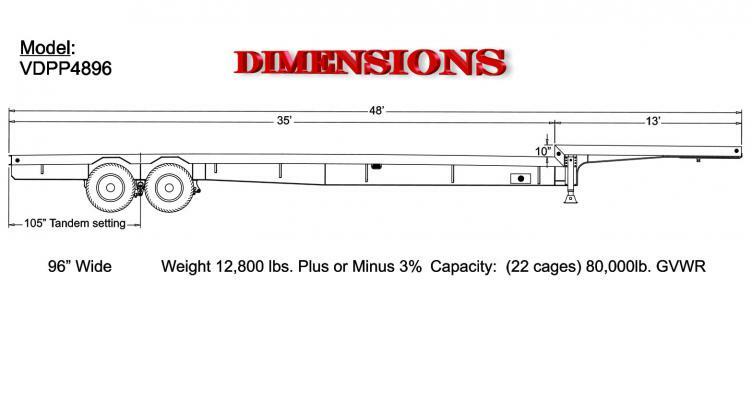 105” from the rear of the trailer with 49″ axle spacing (optional settings available). D.O.T. certified rear underride guard/bumper and high visibility reflective conspicuity tape. Contact a sales representative for additional options to meet your specific needs.